Does the issue of consent between two adults, who married at will, prompt an inquiry? The Supreme Court today asked if a roving inquiry could be ordered into the “issue of consent” between two adults who married at will, and if the Kerala High Court order annulling the marriage of Hadiya, an alleged victim of 'love jihad', was justified. The questions from a bench of Chief Justice Dipak Misra and Justices A.M. Khanwilkar and D.Y. Chandrachud came during the hearing of the Kerala conversion case. “What troubles us is that whether there can be a roving inquiry into the issue of consent between two adults who have agreed to marry,” the bench said. Whether the high court was justified in nullifying the marriage is a pure question of law, it added. “Marriage and investigation are two different things. As far as marriage is concerned, it does not warrant any investigation. Investigation has nothing to do with it. You can investigate any other thing,” the court said. 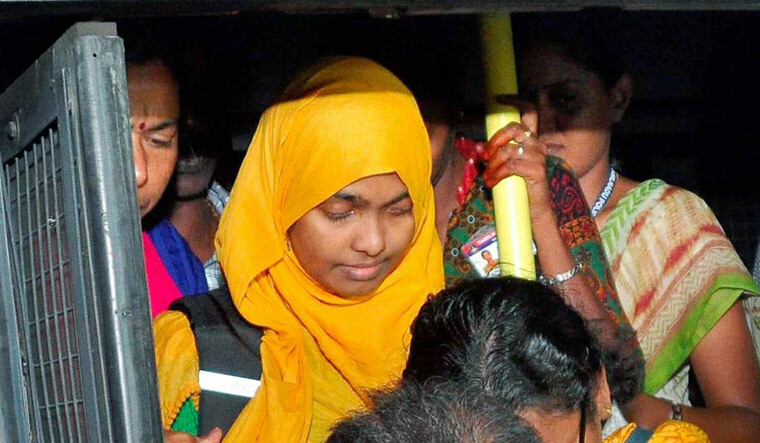 Hadiya, the 25-year-old woman who is at the centre of an alleged love jihad controversy, had on Tuesday filed an affidavit before the top court claiming that she willingly converted to Islam and wants to live with her husband Shafin Jahan. The matter had come to fore when Jahan had challenged the Kerala High Court's order annulling his marriage with Hadiya and sending her to her parents' custody. On November 27 last year, the apex court had freed Hadiya from her parents' custody and sent her to college to pursue her studies, even as she had pleaded that she be allowed to go with her husband. Senior advocate Shyam Divan, appearing for Hadiya's father, said it was a case of vulnerable adults and the high court was justified in nullifying the marriage by exercising its power under Article 226 of the Constitution. “In this case, marriage was used as a pretext to keep it out of the court's jurisdiction,” Divan said. Hadiya had urged the court to set aside the judgment of the Kerala High Court that had annulled the marriage terming it an instance of 'love jihad'. The top court had earlier ordered an NIA probe into a “pattern” where some women were allegedly being converted to Islam. Later, the court decided to hear the woman and interviewed her in an open court when she made an appeal for her freedom under the Constitution. In her affidavit, the woman told the court that “horrendous sufferings” were meted out to her for converting to Islam and marrying a Muslim man. The apex court had on January 23 made it clear that the National Investigation Agency cannot probe the marital status of Hadiya and Jahan.